May Sun, "Symphony of Bird Cries: Prelude to a Good Bye" (detail), 2014, painting on unstretched canvas, 58 x 56"
The mix of agendas and expectations held by engineers, designers, elected officials, and community stakeholders invested in planning public spaces can make the ability to capture the spirit and atmosphere of the cultural milieu in public works of art a challenge. May Sun, a known problem solver, successfully works around factitious restrictions that foster sameness and blandness. Sun’s installations and public art projects are research driven and site inspired. As is obvious in her completed commissions, such as the highly praised “Ripple of Hope” Gateway at Robert F. Kennedy Inspiration Park (the site of the former Ambassador Hotel), her work humanizes the built environment and invigorates public spaces. Her work has typically advocated social justice and the safeguarding of animals and the environment, while questioning outdated assumptions and values. This exhibition, “In the Studio and Out in Public,” showcases selected photo documentations of her celebrated work in the field of public art, augmented by mixed media installations from her artist’s residency in Giverny, France and filled out by a collection of studio based paintings that reflect her enticing personal history and rich family heritage. Born in Shanghai, her mother was an accomplished classical pianist. 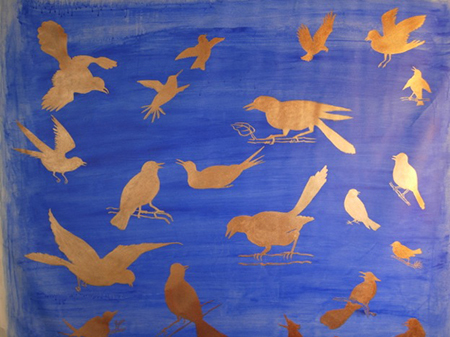 Sun references both of her parents in the painting “Symphony of Bird Cries: Prelude to a Good Bye.” The large unframed work features a collection of singing golden birds adrift against a brilliant complimentary blue background. Inspired by a booklet of illustrations belonging to her father, a Chinese landscape painter, the images depict open mouthed birds. These convey a musical element that pays tribute to her recently deceased mother’s musical prowess. Sun’s love of animals is apparent in the captivating drawings she has made of her studio companion, a Bulldog named Palomino. The affection symbolized by heart shaped markings on Palomino’s coat effectively transfers into a central element in relationships that will evolve out of the adoption process of shelter animals at locations such as the Northeast Valley Animal Care Center in Mission Hills. Sun created the bell ringing sculptural entry element that greets visitors there, a space partnered with Best Friends L. A. Headquarters. Another commissioned gateway of sorts, the Union Station East Portal commission, “City of Dreams/River of History,” features a tiled “river’ bench, complete with river rocks and excavated artifacts from the site, along with an oversized salt water aquarium housing fish indigenous to the Southern California coast. The fish caught motionless in the photograph taken at Union Station, offer up an interesting contrast to the continuous footage of koi swimming in a pond and eating oranges captured by Sun in Monet’s garden. Both visions, and many other works by May Sun in this insightful exhibition, offer an intersection between past, present and future, between art practices and among diverse ideas. All this is accomplished without sacrificing Sun’s distinctly personal interpretations, reflecting the standards that govern her life and raise her work up above the ordinary.